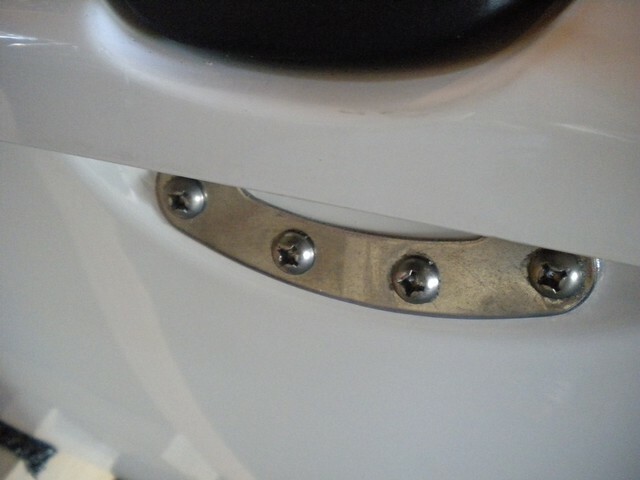 The extra shroud anchor plates I elected to add were positioned in place via the rear outboard crossbar bolts. Next, the hulls were drilled for the (4) 1/4" bolts. 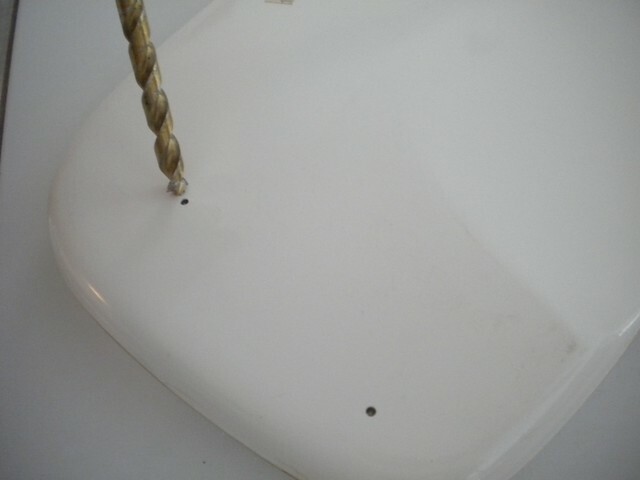 It is nice to keep the drill reasonably perpindicular to the hull shape as shown. 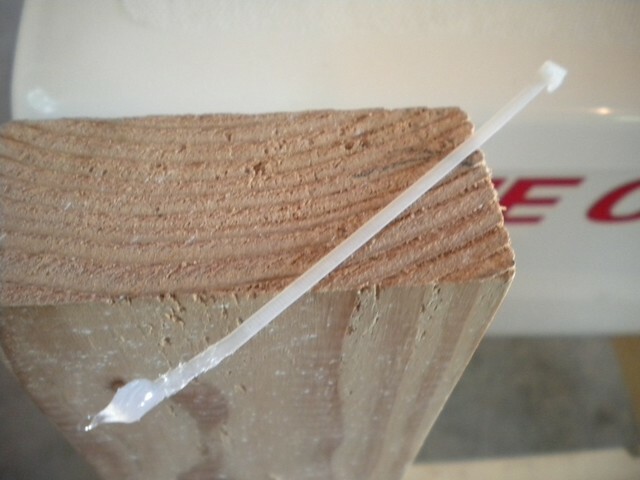 I used the pointed end of a small cable tie to coat the walls of the holes through the hulls with silicone. 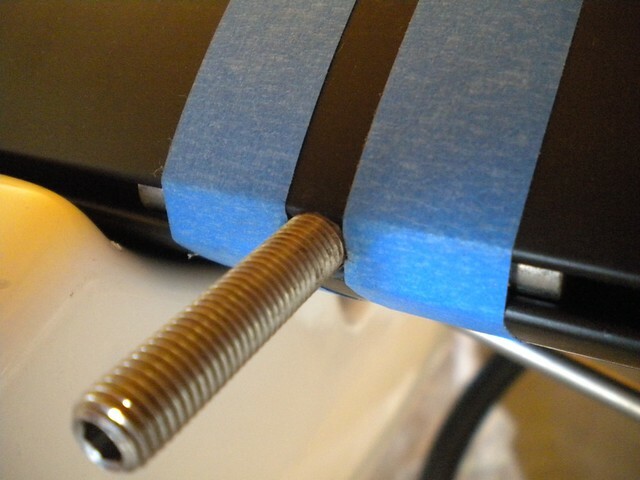 Used a dab of silicone around the threads of the fasteners before installation to ensure a good seal...gives a small (ideal) amount of squeeze out around the head of the bolts. 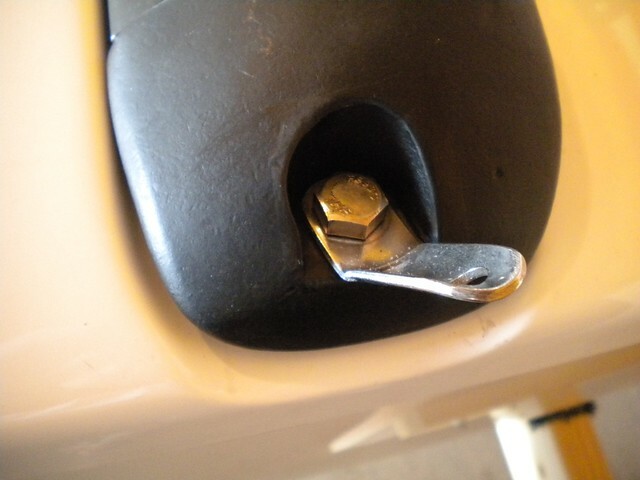 Applied a fair amount of sealant to both sides of the washer before tightening the nylock nut. Ensures a good seal, hopefully for the life of the boat. 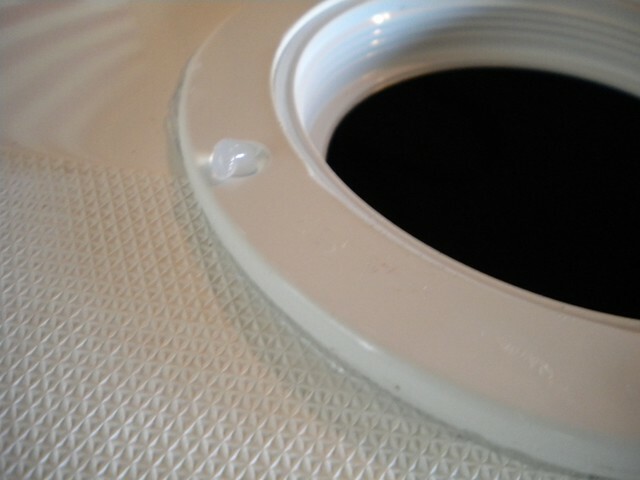 Final install of the deck ports: First I smeared a ring of sealant around the opening and inside lip in the hull, and then layed a thick bead on the shoulder of the deck port itself. Installing a port. 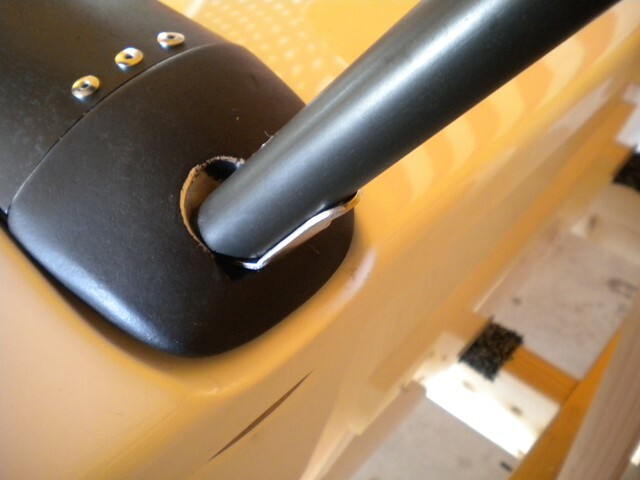 Minimal external squeeze out...mostly just through the fastener holes. Very happy with that, since it is hard to get the stuff out of the non-skid areas of the decks! 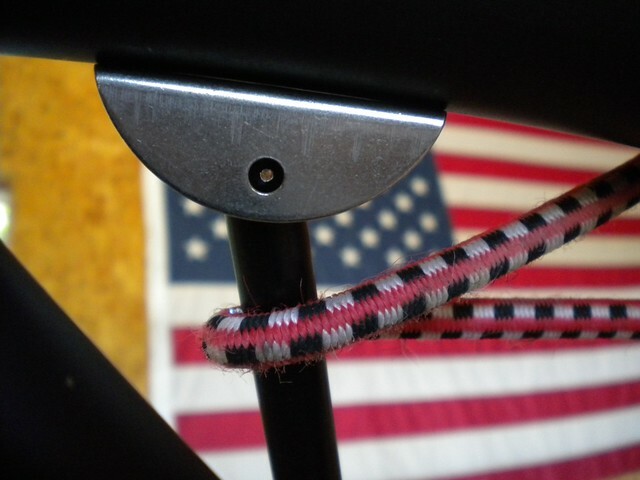 Hobie did not drill a tramp lace line tie-off hole in either hull lip. 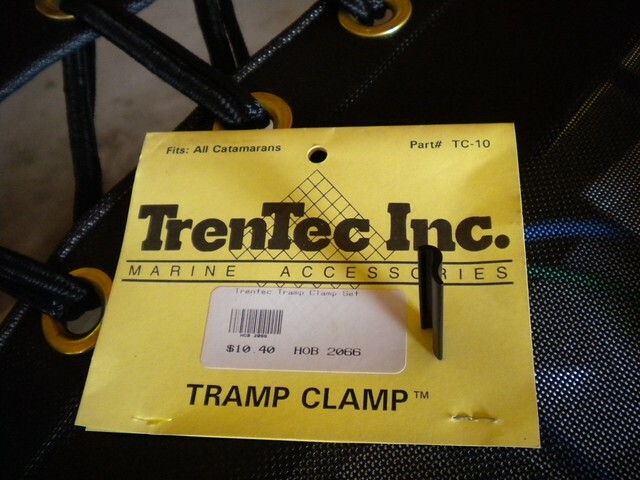 I went ahead and drilled these at this time in preparation of the main tramp installation. 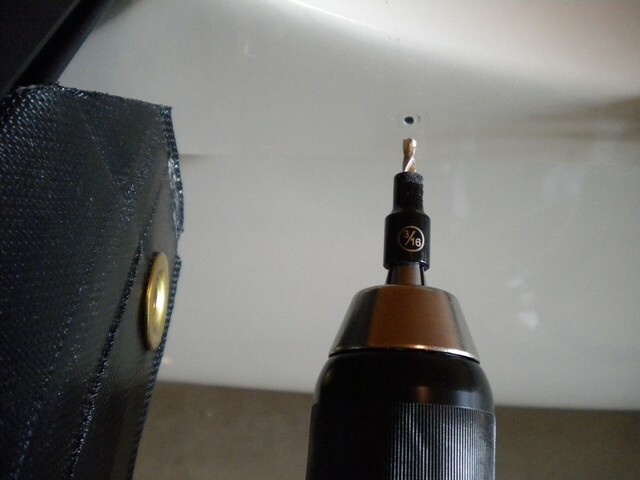 After marking their locations, I drilled a small pilot hole. 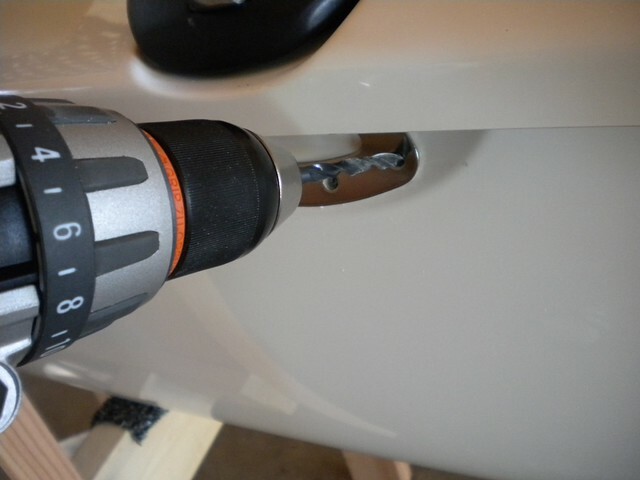 The socket acts as a depth stop to prevent accidently touching or drilling into the hull once the drill is through the lip. 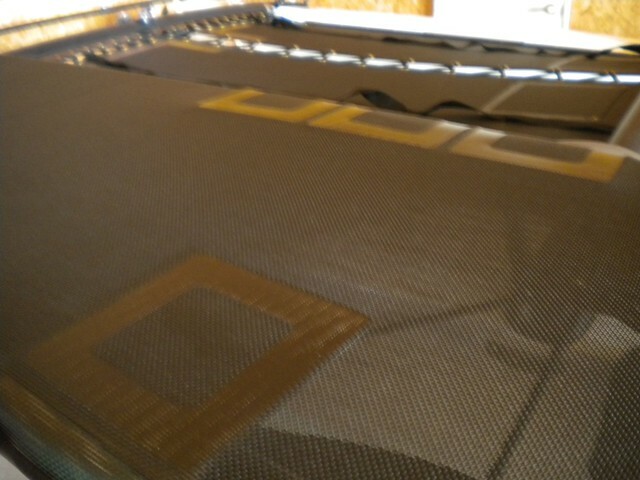 Enlarging the pilot holes. I made a larger depth stop out of some scrap PVC tubing. The depth stop is crucial in this application as the larger diameter drill could try to lunge through the hole just as it is finishing. Finished hole. You can just make out the ghost outline from the depth stop...the drill bit probably was pulling / attempting to lunge with a fair amount of force. 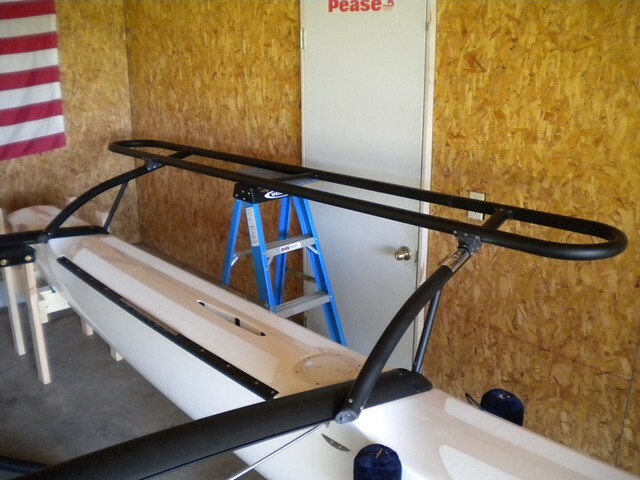 I had planned to begin installing the trampoline at this point, but have instead started installing the SX wings and associated hardware...a very wise decision, as I have spent much time standing inside of the hulls during the fitting process. Therefore, the next update will be on the wings. Where did you get the SX wings? I had picked up the set of SX wings a while back and had been storing them for a project just like this. They are virtually the only used parts going into the project (since new complete sets of wings are no longer available from Hobie). Fortunately my set looks to have maybe one light season worth of use...no fading, virtually no scratches, stickers are nice...should look good on the boat and match up nicely. Keep in mind that most of the operations here are repeated (3) more times...adding a set of wings and getting them to fit well takes substantial time. 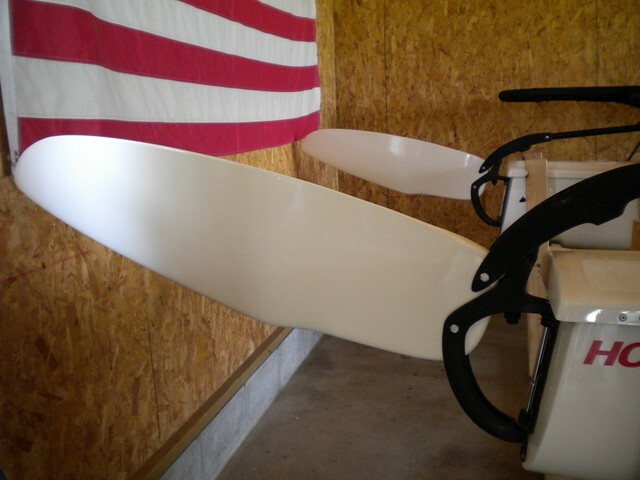 Most H18 wings I have experienced all have some degree of torsion or binding present in them when in sailing position...due to age and an impatient installation, most likely. 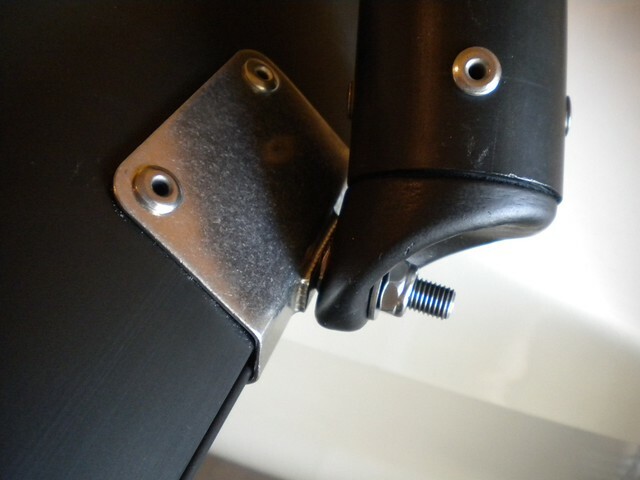 I ended up purchasing two additional new wing legs for one side since I wasn't happy with the way the existing legs were mating up to the crossbars...new legs allowed me to obtain the best fit and rivet them to the seat rings in the correct orientation. 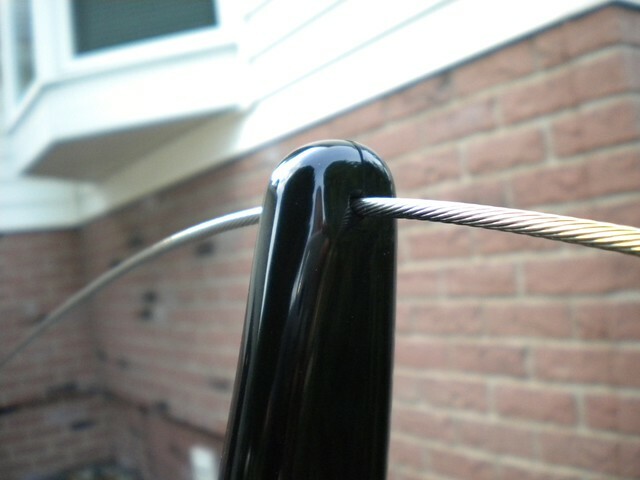 One nice plus of the SX wings versus the Magnums...there is some adjustability. My end goal was to have the wings sit down perfectly on the crossbars with no binding, and properly transfer the occupant loads without damaging the wing leg support struts (and stressing the welds). Took a lot of fitting...but the final result is worth it. Locating a wing in position. 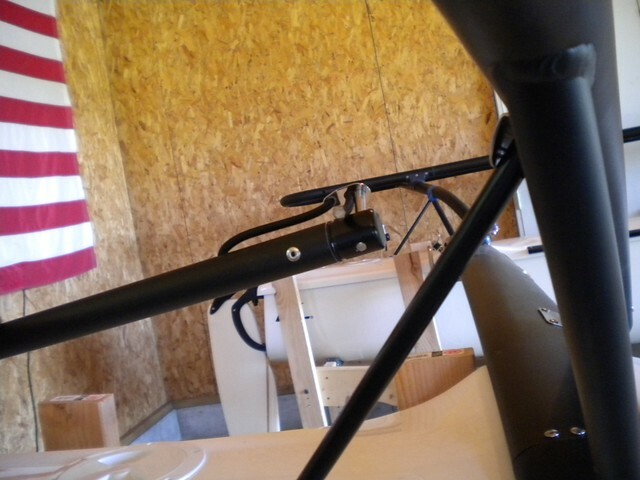 I used a stepladder with some padding of convenient height to 'hold' each wing until self-supporting. Really helped out. 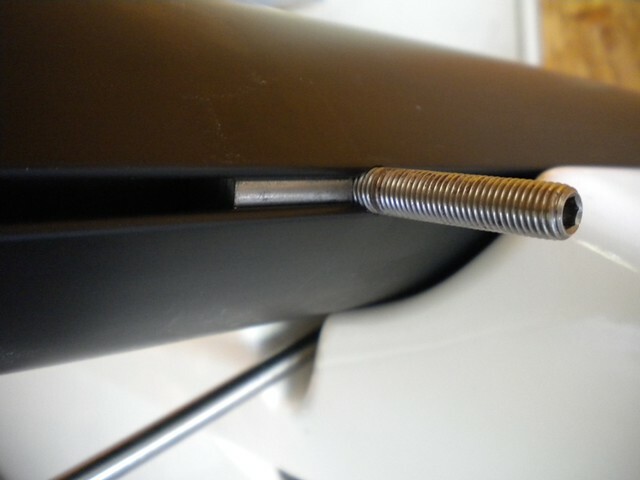 Each crossbar end cap required some material removal to allow the wing leg support strut to fit properly, and in some cases for the support strut tab (the small stainless steel piece in the following photo) to seat flat against the crossbar end cap. 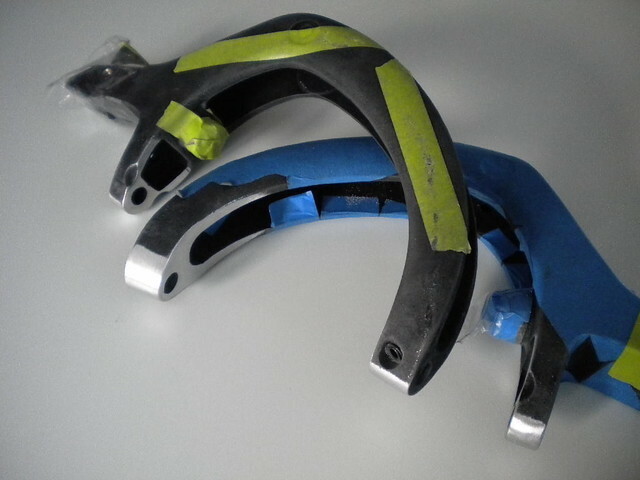 In most cases the wing leg support struts also can benefit from some shaping, in order to ensure that there isn't any edge-loading and torquing of the strut occuring. 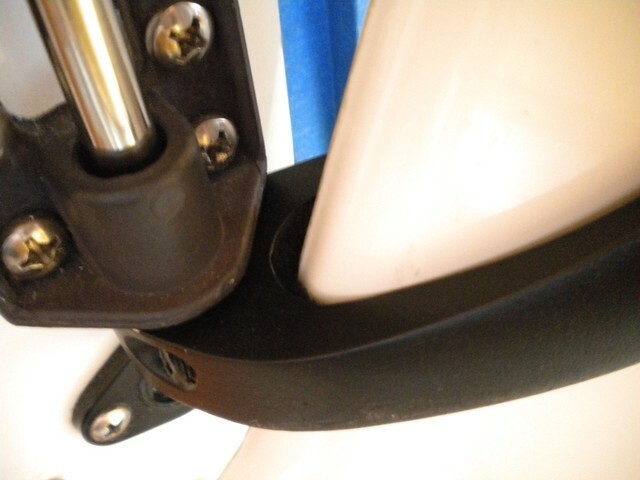 This next photo shows how the strut fits nicely into the newly created pocket of the end cap. Daylight through the pin hole! Definitely a good thing. Looks like the tab needs to be rotated slightly aft a tad more. 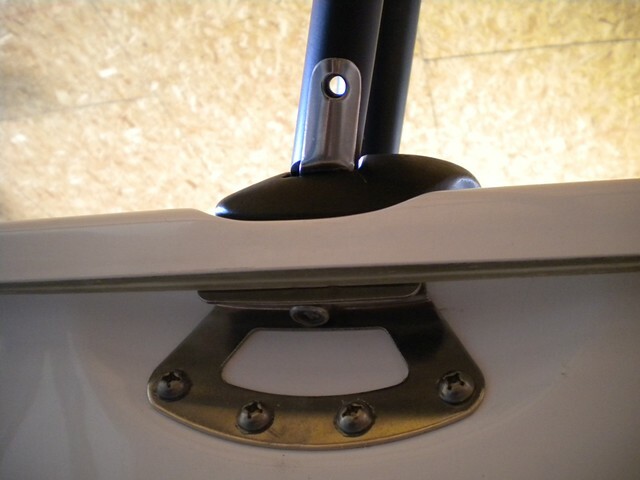 The stainless tab helps to lock the support strut in place to prevent movement that would stress its' welds. The tab and strut should meet exactly as the wing 'lands' at the crossbar end cap. Disassembled, prepped, masked, touched up, reassembled. This time hopefully for good! Pinned. 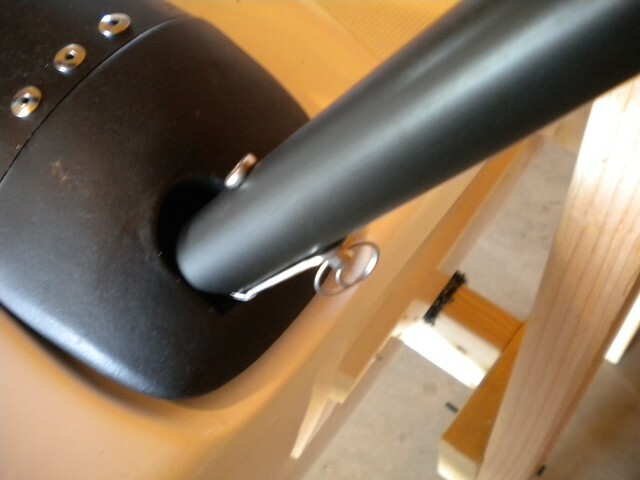 Some people use 1/4 bolts instead of pins for extra stability. Might help, can't hurt - sure is a crowd pleaser. I like pins for the convenience...if the wings fit well this isn't likely to be the weak / failure point. Now only three more corners to do! 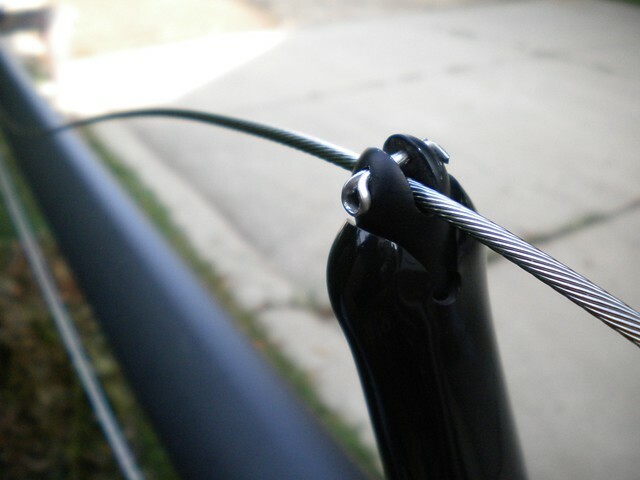 Here is a pic of a front connection for reference. 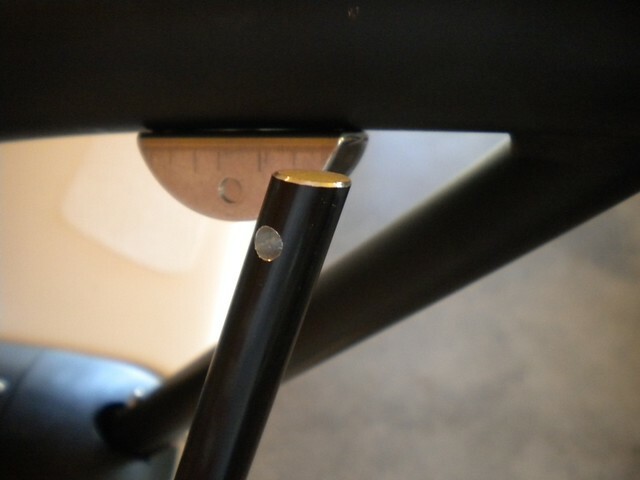 These differ slightly since the stainless tab needs to be bent to a sharper angle to meet the leg support strut better (front and rear wing leg support struts are welded at differing angles). 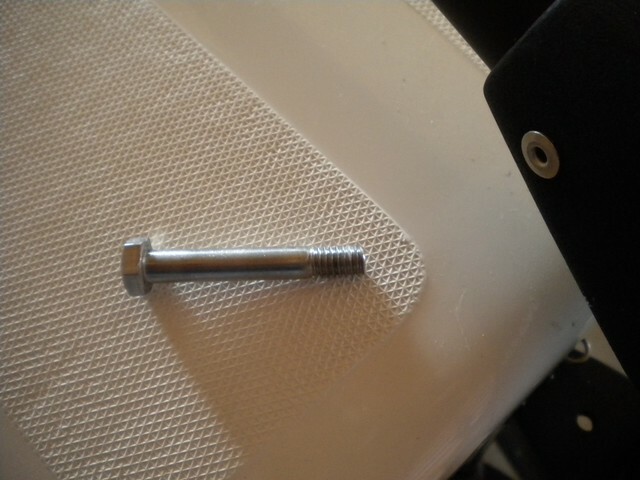 The crossbar slot needs to be enlarged for the 5/16 threaded mounting studs. 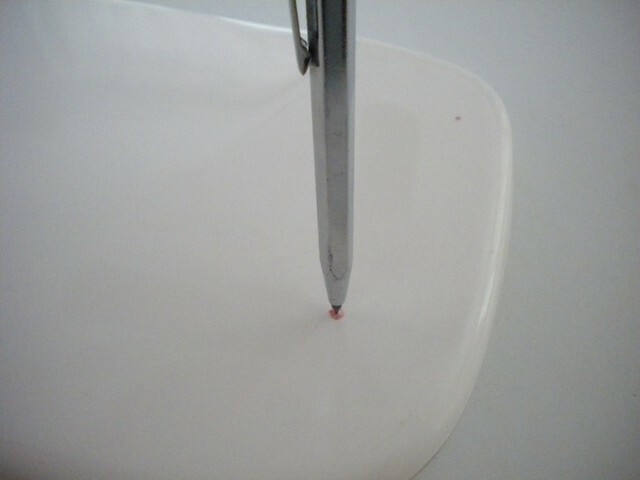 Best to remove as little material as possible...provides better final support for each wing leg. Installing the anchor plates. 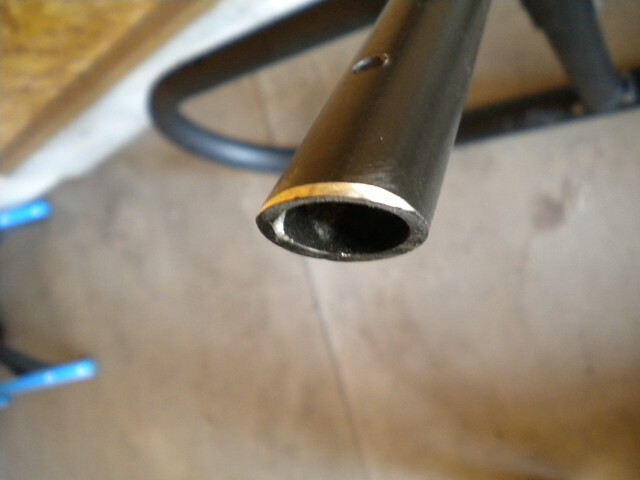 I used a simple tournequet style clamp to keep them from moving and conform them to the crossbar curvature during drilling / riveting. 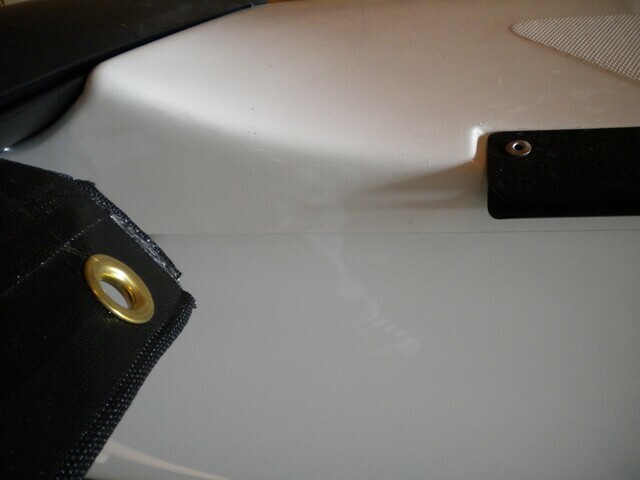 Installed wing. 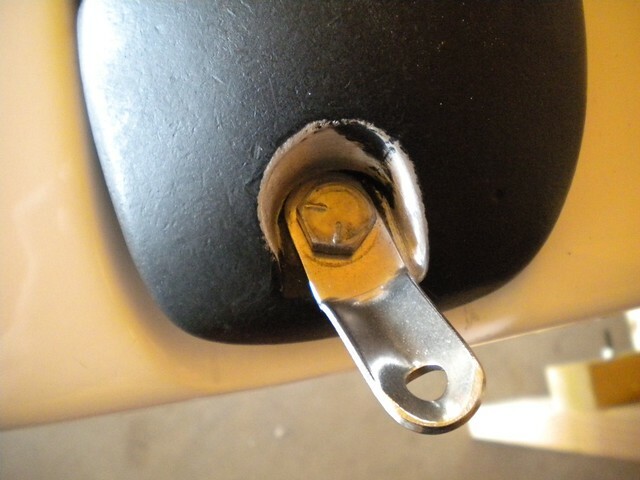 A somewhat common problem is that the jamb nut and anchor plate attempt to 'move' the wing assembly forward so that the wing leg support strut no longer wants to fit properly in the crossbar end cap (without significantly stressing the wing leg support strut weld). In several cases I counterbored the leg end cap to partially fit over the jamb nut so that the wings would rotate and sit down around their correct axis...works excellent. 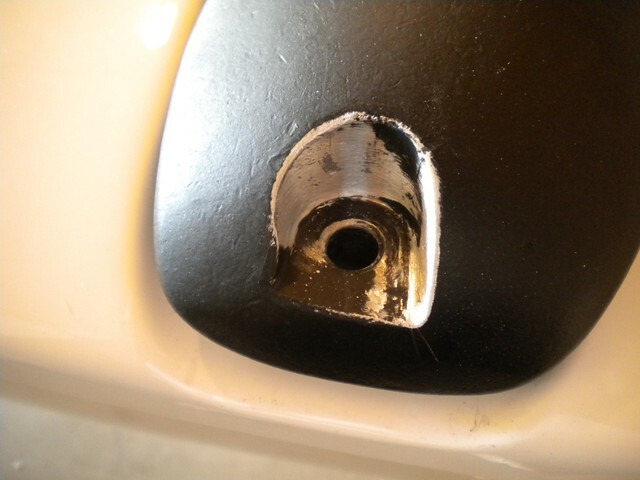 Obviously this results in some loss of strength in the end cap, though I have never seen an end cap failure where the mounting hole split out...they usually seem to fail where they are riveted into the leg by shearing the rivets, freeze damage with entrapped water, or corrosion. Full up (forground) and full down (background) have lots of room. 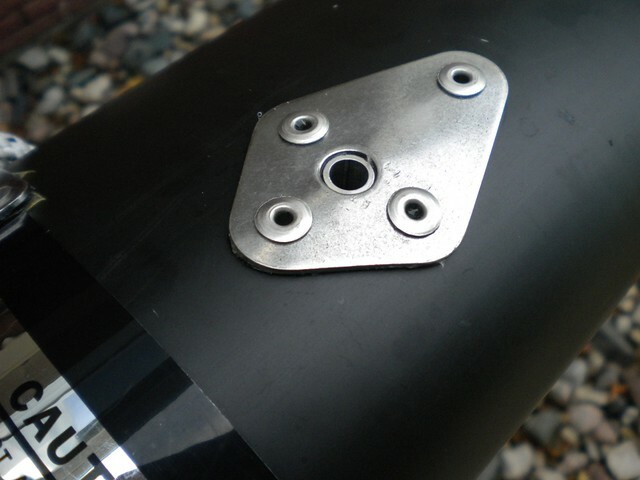 Pilot hole drilled in upper attachment point. 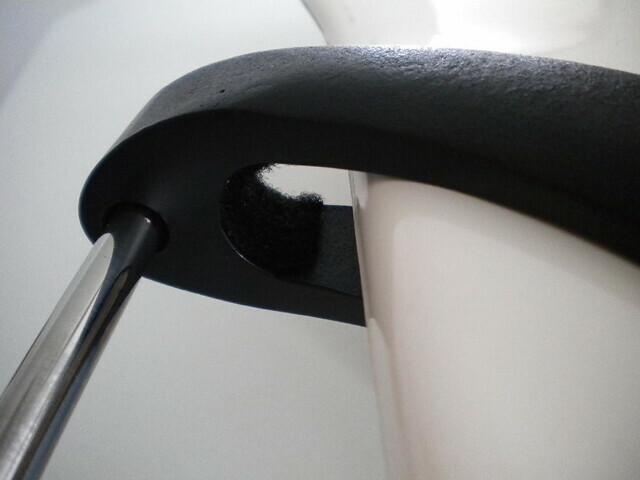 I have already riveted the upper mount in final position at this point. 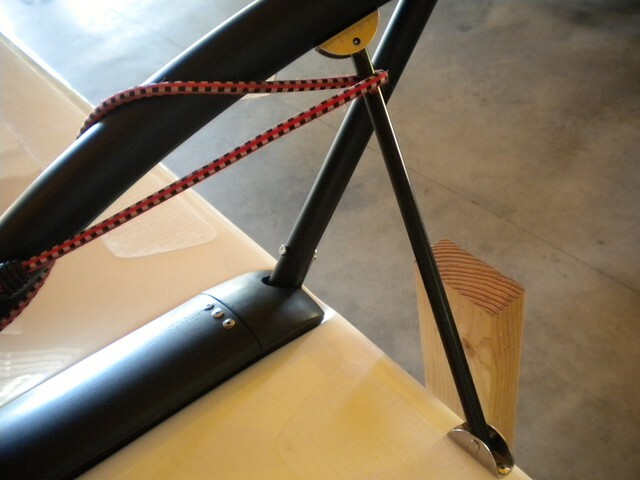 The bungee is being used to take up any slack between the support rod & wing. 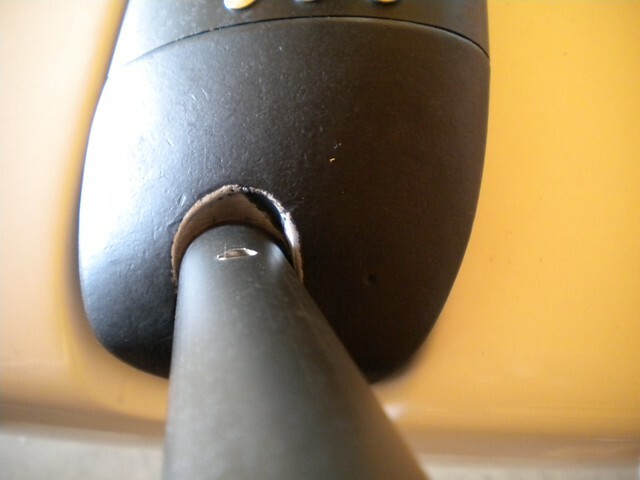 Hole drilled to final size for pin. 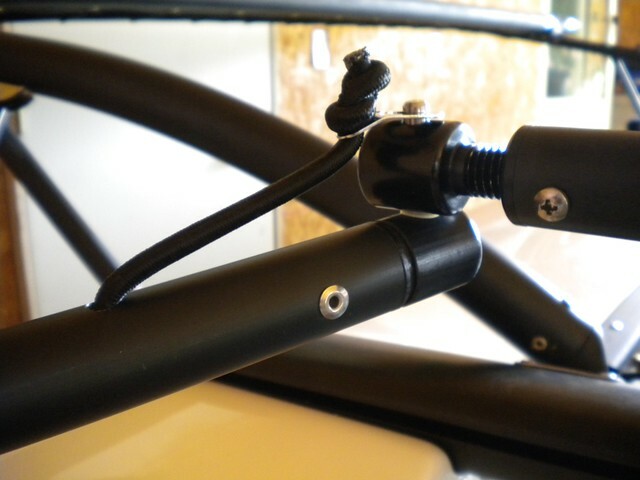 I also angled the ends of the rods so they would fit nicely into the mounts. Resulted in a beautiful rigid no-slop install. Stunningly beautiful and wonderful craftsmanship! The mods should consider pinning this post; its a "Hall of Famer" for sure. Thanks very much for sharing. Thanks for the accolades, guys (& gals). 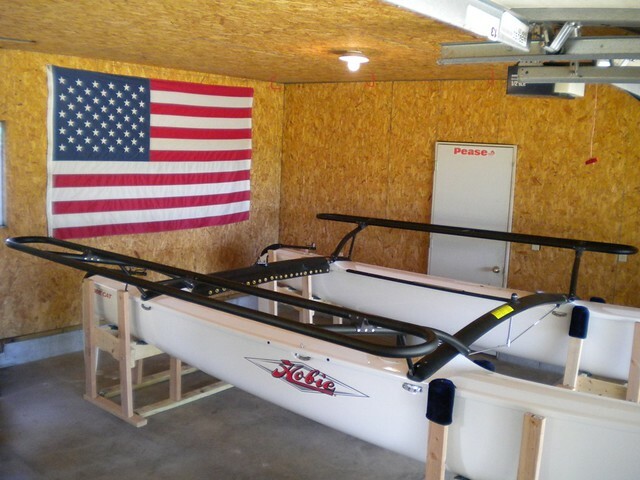 I think the general complexity and capability of a decked-out Hobie 18 is something beautiful, functional; elegant even. Among catamarans, the Hobie 18 possesses a unique combination of atributes that really makes it a special boat. Tops on my list of those would be durability, the option of wings, smooth & powerful ride...yet still light enough to be handled by one person. A truly great beach cat! This boat is going to be an absolute beauty when you finish it! Even when they were still in production, I doubt very many Hobies received this level of detail and diligence during assembly even when the boats were in production! Thanks for posting it here and letting all of us follow along, I'm really enjoying watching the boat come together! I agree with Brian, this thread should either be pinned or linked to from the "H18/SX FAQ" thread at the top of the forum as a how-to guide. You've already given me a number of ideas for minor modifications to make to my boat to improve it's longevity. 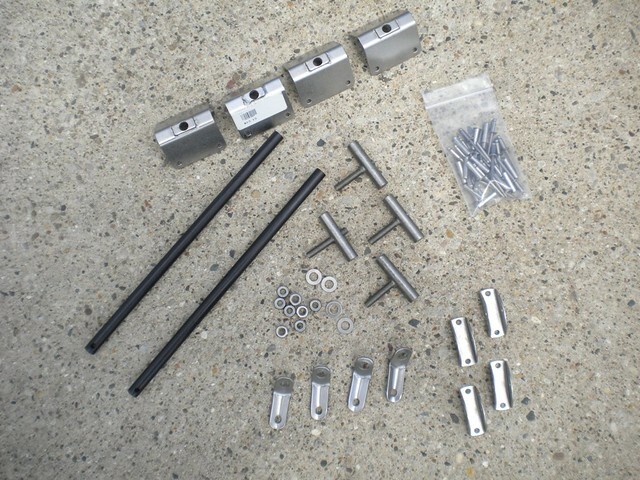 Are you planning on adding an SX mast to it to make it the true SX, or just using a standard SE mast with the SX wings? 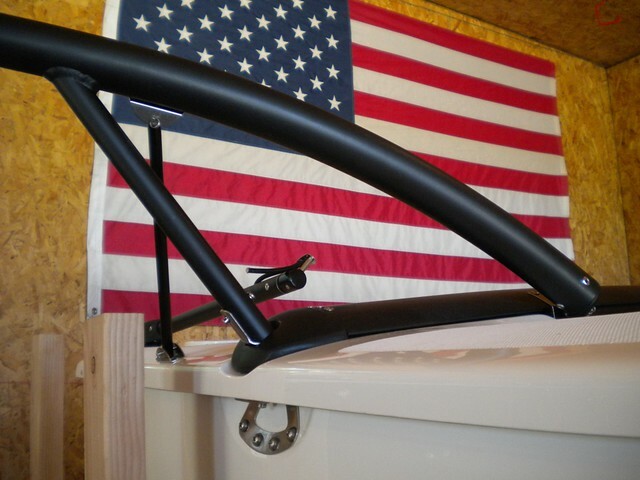 Standard SE new comp-tip mast, rig, and OEM Hobie dacron custom sails...will give me the option to race the boat (without the wings) in the future if desired. I figured this would give me the most options. centralmichigansailor, you have my unbridled envy. Beautiful boat....simply awesome! 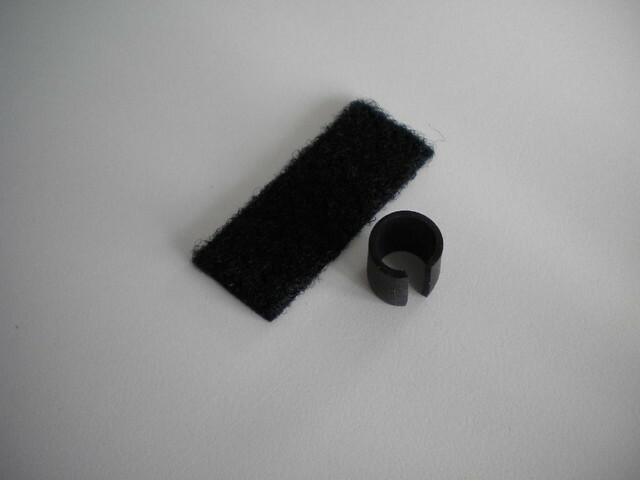 Where did you find the rivit backing washers you used for the tramp tracks? 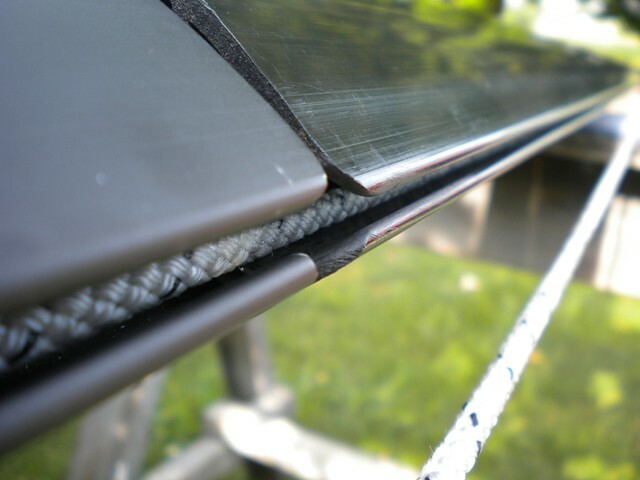 Where did you find the rivit backing washers you used for the tramp tracks? I couldn't find anything commercially available that was suitably curved either so I made a die and punched them out myself. The hulls come from the factory with the one piece cast euro gudgeons...which have an interferance fit with the lower casting. 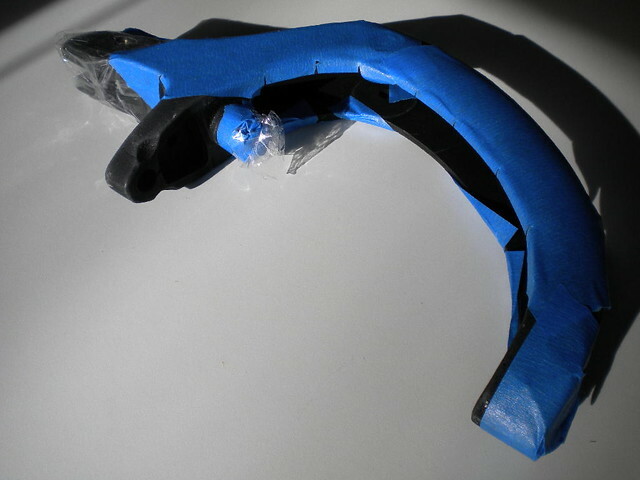 So it takes a bit of work on the lower castings to get everything to fit, but the results are worth it! In all, it takes between .200" to .250" (about 3/16 to 1/4 inch) of material to be removed from the lower casting in order to have the casting fit onto the gudgeon attached to the hull. This is without removing material for using the stainless steel washer in the assembly as is the regular rudder assembly practice...I am going to moniter how the plastic bushing shoulders in the euro gudgeons wear...but I don't think the washer will be needed, and I really didn't want to remove any additional material if not necessary. 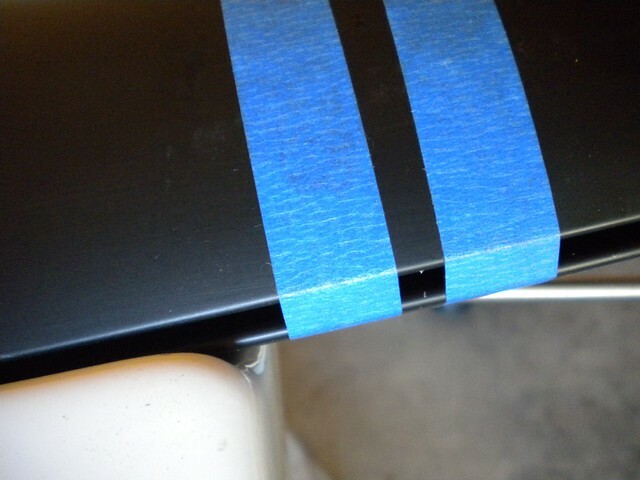 I used painters tape to keep from scratching the castings while handling them (they are new), and the blue tape on the bottom is lined up with the initial "rough out" mark. Also tape every orifice off to keep dust out. I removed .060 to .065 from the top part of the lower casting just to square everything up where it sits on the bushing in the gudgeon (both gudgeons and rudder castings use bushings), and then removed the remaining material off the bottom of the rudder casting (.150 to .180, depending on the side, each casting is unique) in order to maintain clearance away from the drain plug housing on the hull (not much extra room, so plan accordingly). 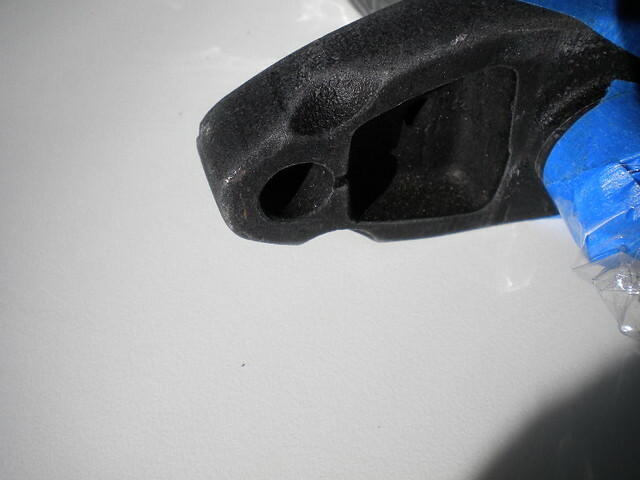 This also took care of about 99% of some surface casting porosity. 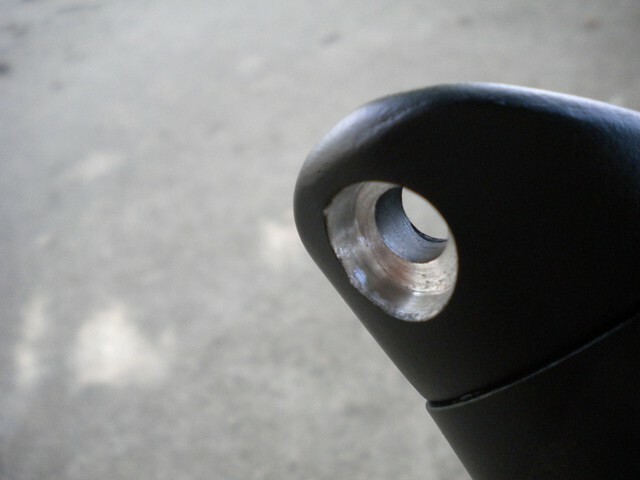 It is nice to square these surfaces up since they ride against the large shoulder of the bushings in the euro gudgeons; it helps to spread the load out and minimize early wear. In addition to that, I had to remove a surprising amount of material around the perimeter of the castings since the 1-piece gudgeons don't extend out from the hulls as far as regular stainless gudgeons (material removal required to allow clearance / casting rotation). I faired the removed material into the rest of the castings both for looks and to avoid stress concentration (the 'step' that resulted from the initial material removal). Cleaned & touched up the castings with some custom-blended paint...might not last as long as re-anodizing, but I am not in salt water, either. Cleaned with near boiling hot water...does a great job of getting rid of the grey aluminum dust and getting everything back to black again. Counterbored the rudder pin holes for the nylon bushings which made a HUGE difference in the amount of "play" in the bushing...they are kind of a sloppy fit otherwise, even brand new. 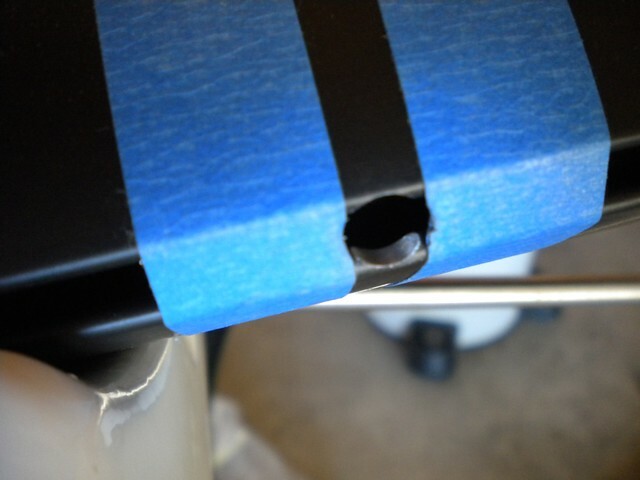 Capturing the shoulder of the bushing really tightened things up nicely, and should help keep them epoxied in place. 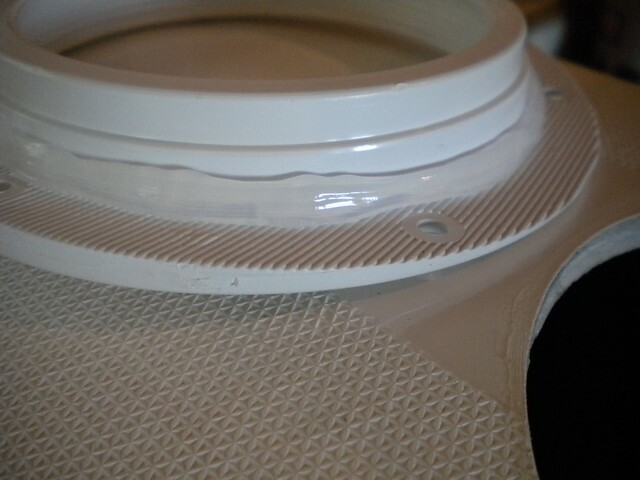 I scuffed the outsides of the bushings before gluing in...I have had problems with epoxy sticking to these before. 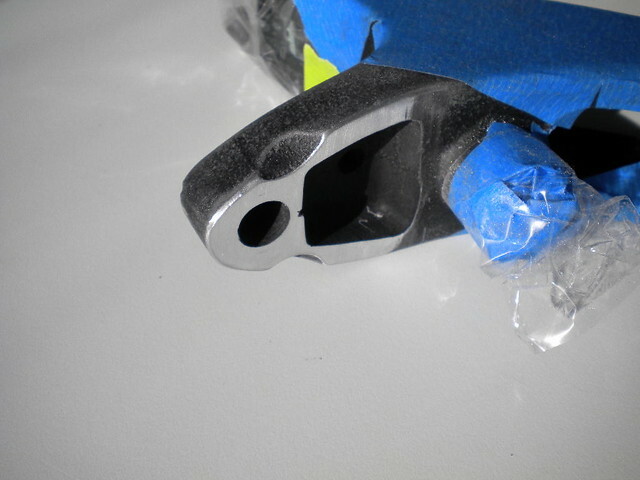 The top bushings (see pic above) I left slightly proud to facilitate retainer pin removal and to keep the retainer pins from rubbing on the castings. 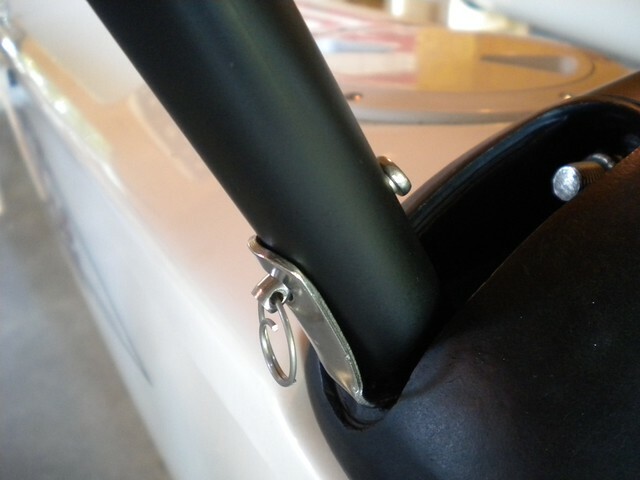 Rudder pins are custom polished stainless for a silky smooth feel (for now, at least!). 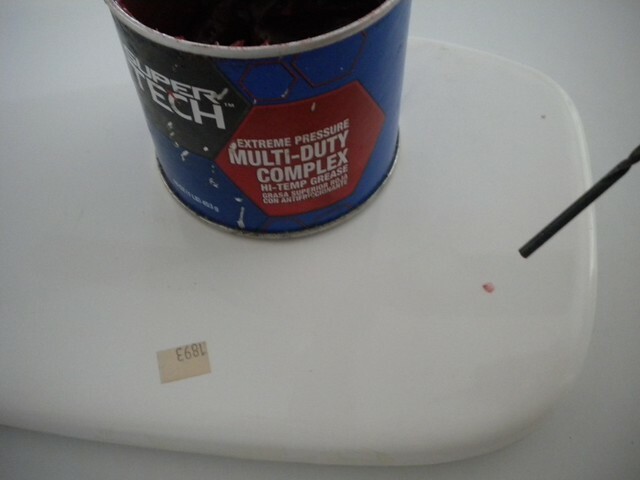 I set my blades up raked forward, and have had good luck using 3M adhesive backed velcro (use the fuzzy side only) as a bump-stop against the casting...use a sliver of rubber (stolen from a soft-grip ink pen) underneath for even more protection or as a shim if needed. 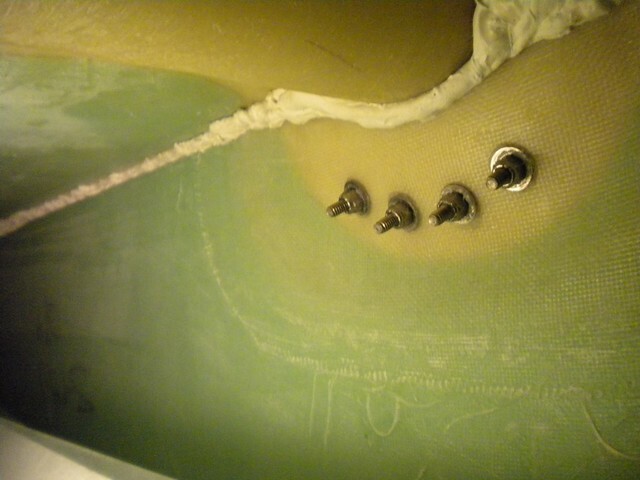 The first step was to attach the lower rudder castings to the transoms. Next, I zip-tied the upper castings to the lower castings with the adjustable cam & plate set for 85% of the maximum allowable forward rudder rake. 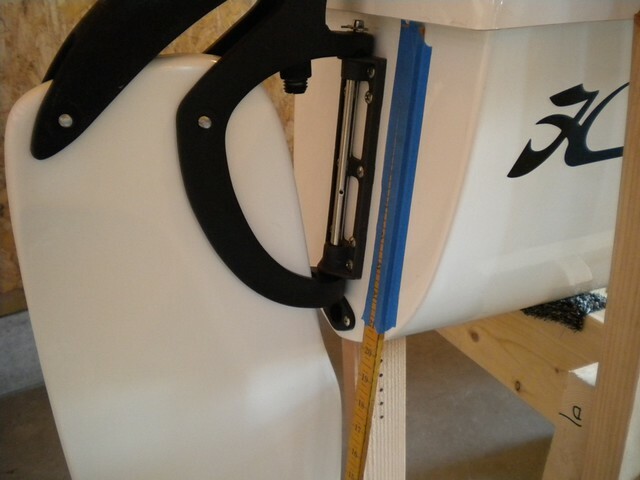 I then taped a nice straightedge (wooden ruler) to the transom. Next, I fit a new (undrilled) rudder blade into the castings, based on desired rake angles compared to the straightedge attached to the transom, and allowing for edge clearances for holes once drilled in the blade. I then marked the hole locations for the blade through the existing rudder casting holes. This job requires a helper; one person to locate and hold the blade and another person to mark the hole locations. 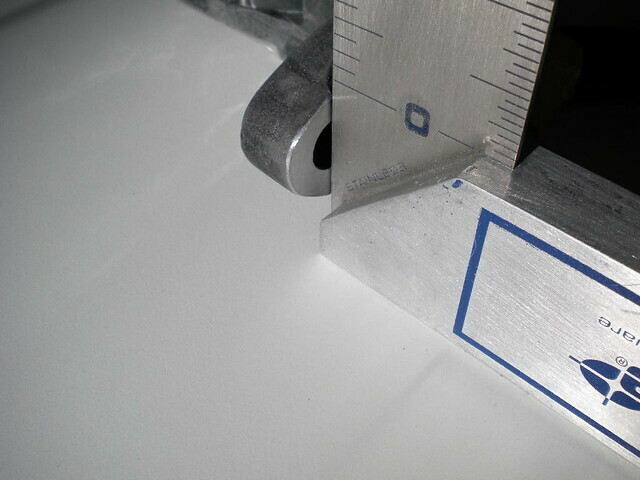 The following photos show this general layout (blade has already been drilled in this photo). 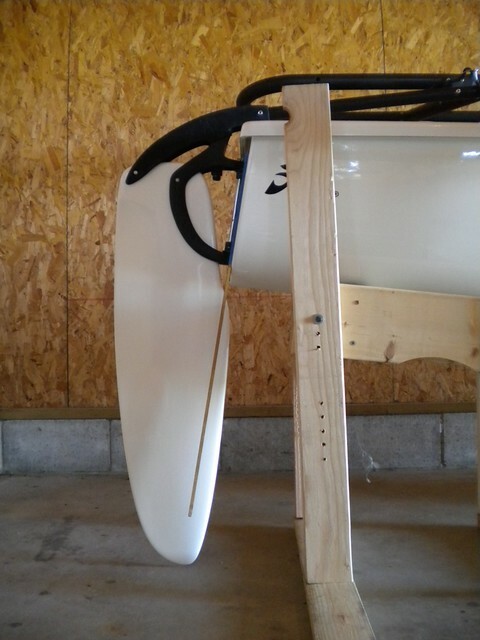 The above process makes certain that the rudder blade will be in the correct position when locked down & sailing (once drilled and installed). 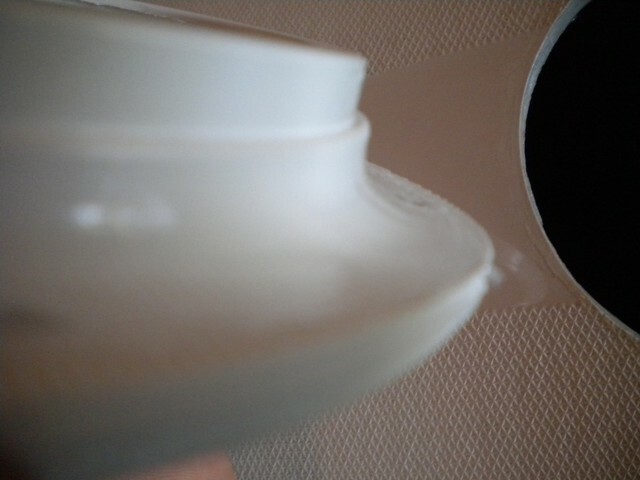 I have found that there can be a surprising amount of variance between castings and adjustment plates in the rudder systems, which means that one rudder blade may fit quite differently in separate castings. 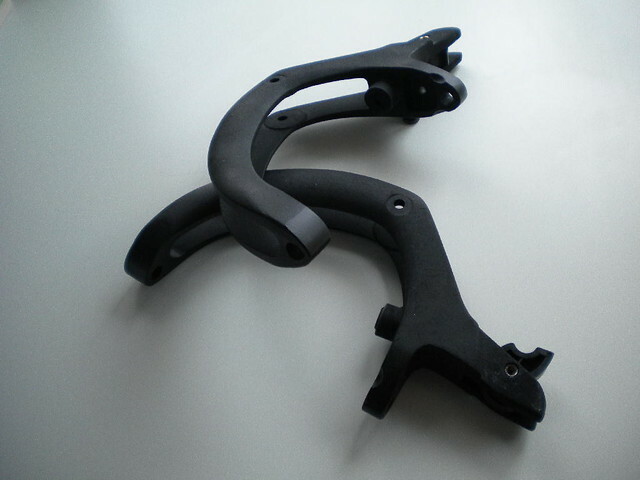 This is due to the fact that the maximum achievable rudder rake is extremely dependant on the fore-aft placement of the lower rudder casting hole, reletive to both the lower blade bump-stop (or adjustment screw) and the upper casting adjustement system. I then enlarge the pilot slightly before using a step drill (and a drill press) to drill the holes through and to final size. 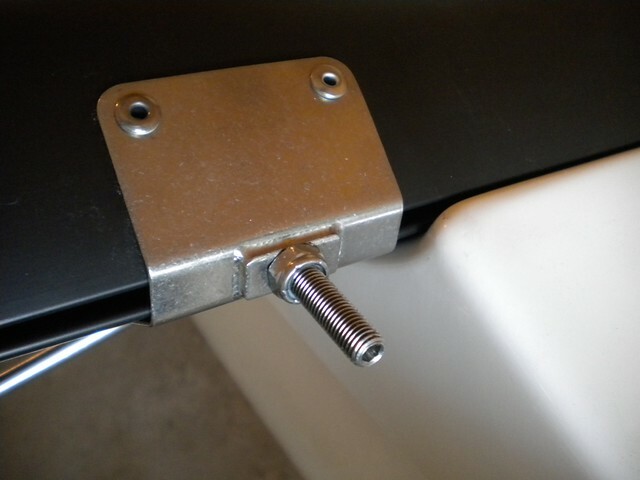 I used some old-stock rudder bolts...these have a longer shoulder (less threads) that fully support the rudder blade...these are the best (if you can find some). There is a point where too much rake would result in the holes being drilled and the castings being attached to the blade in such a way that the system would NOT lock up for beach storage...I did not realize this until I had already drilled the blades...I was lucky, but I am near the edge of the range...you can see in the next pic that the blades lock up very high. Much more rake forward and I don't believe the castings would travel in such a way to allow the upper casting to get up to the 'step' and sit on the lower casting. However, I have lots of rearward adjustment should sailing prove that they are too far raked forward. 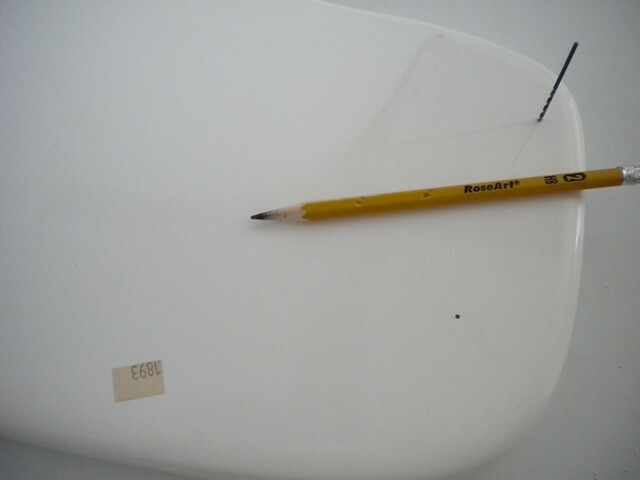 The rudder blades that I am using are some new-old stock white fiberglass blades...I prefer the look of white, but wanted the stiffness and performance of glass...These are a nice blade, and handle really well with a solid feel. 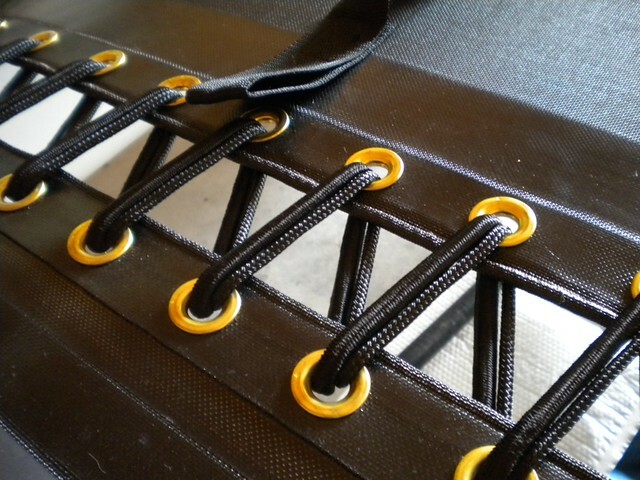 I double-laced the main tramp; first with a shock cord lace kit to tighten and position everything nicely in place, secondly with some standard 1/4" low stretch line to eliminate any bounce. I found that it works best to keep the two lines side-by-side so that each can work independantly. 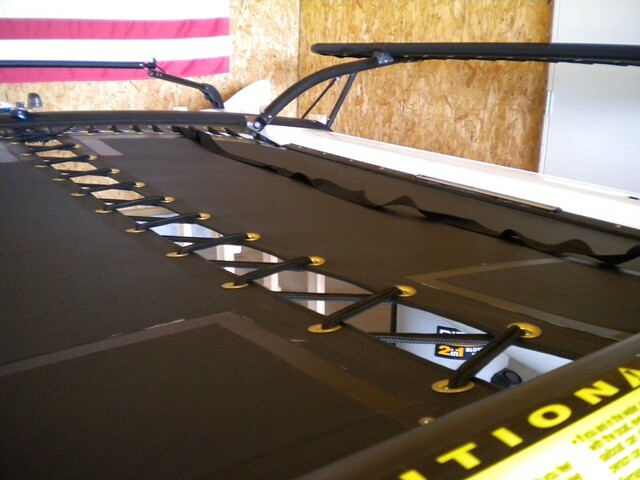 This was the easiest tramp to tension that I have ever installed...the shock cord instantly took up any slack as I tightened the 1/4" line. Worked well. 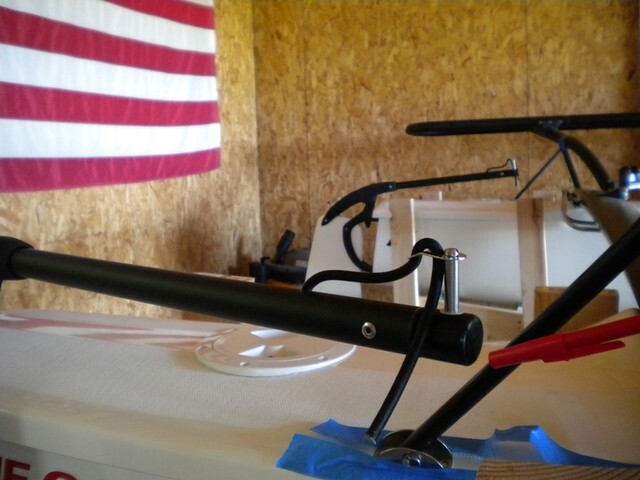 Spent a bit of time working on the mast the other day, which comes mostly assembled from Hobie. 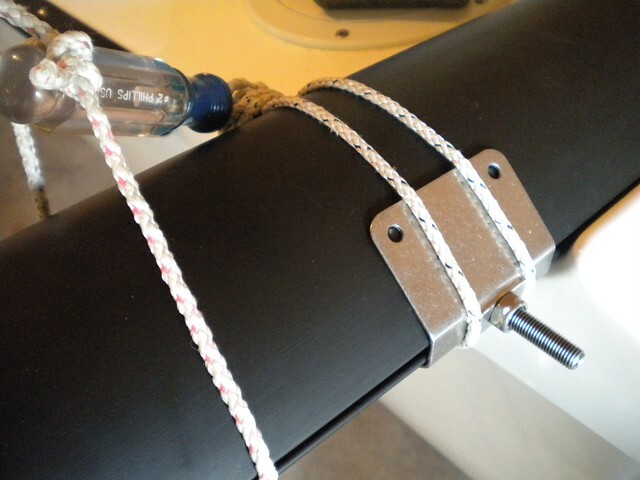 I had to add the diamond wires and spreaders, as well as the mast rotation arm and my downhaul system. 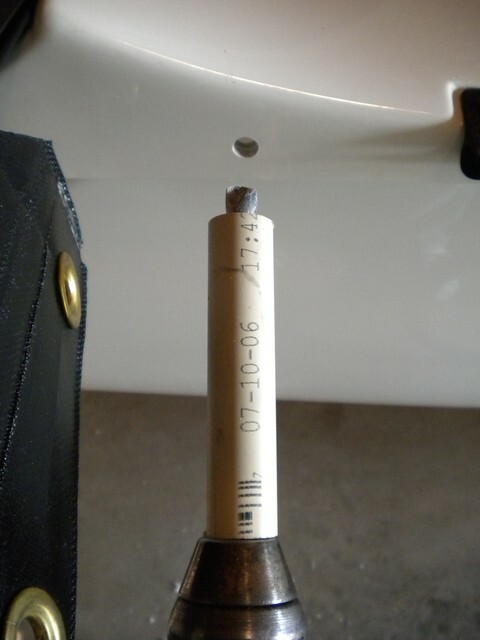 Here is a photo of the metal insert at the top of the Comp-tip section. 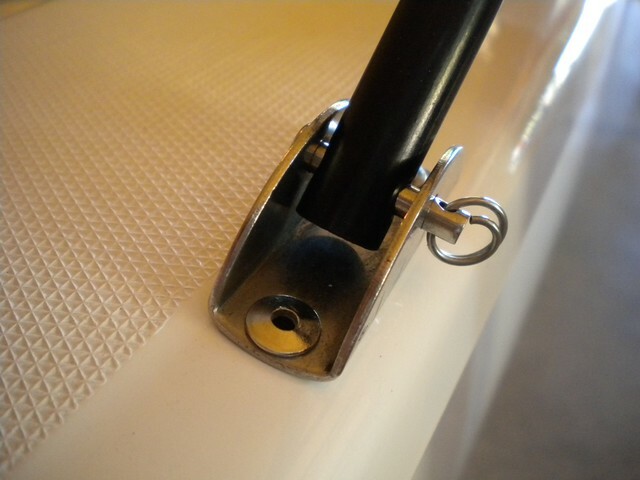 This update is designed to keep the top of the sail from pulling out of the plastic track and binding. 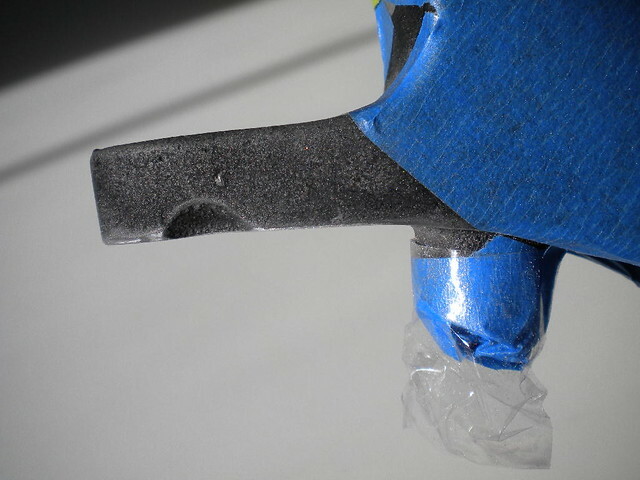 I spent some time fairing the bottom edge of the plastic track of the comptip (where the sail transitions as it is bring raised) with some sandpaper in order to prevent the sail head from catching. 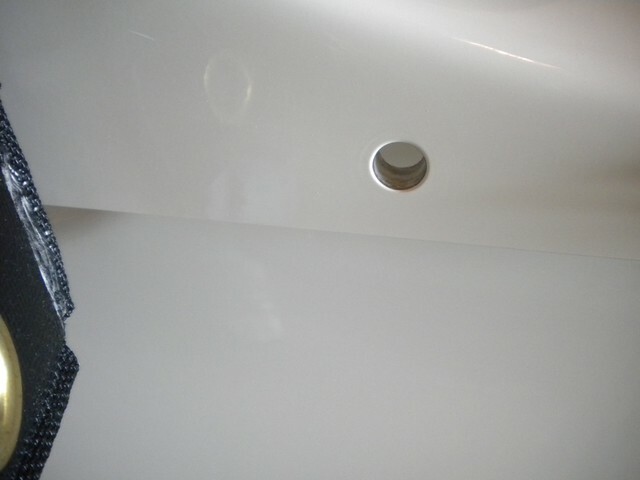 Not a perfect finish, but much better than nothing at all. Could do better if I removed the track but I didn't really want to do that to a new mast. 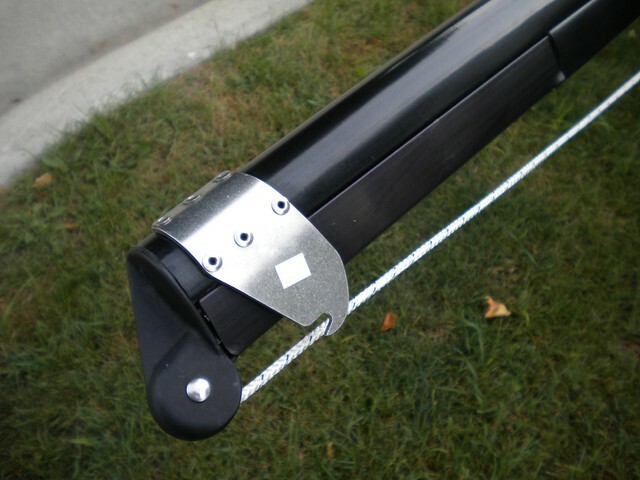 I used some of the Hobie spreader bar end covers while installing the diamond wire system. 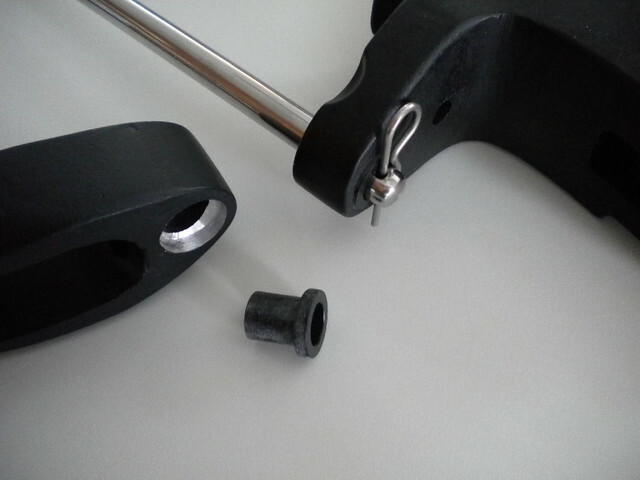 These are very nice to have and offer good, durable protection for the jib sail. 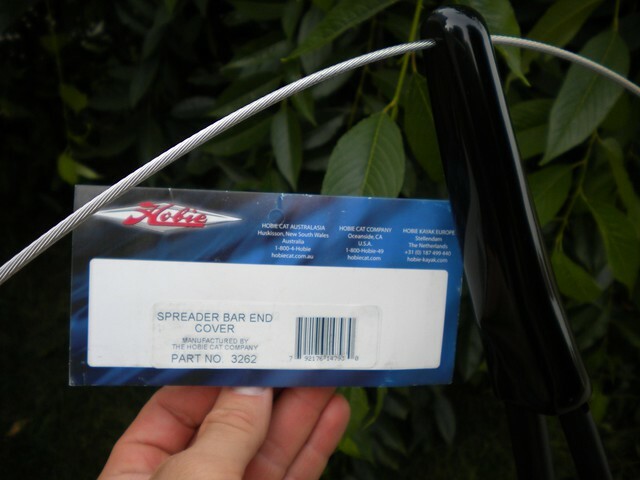 I pre-bent the head of the spreader wire cotter pins before installation in order to allow the spreader covers to close. It is a tight fit. 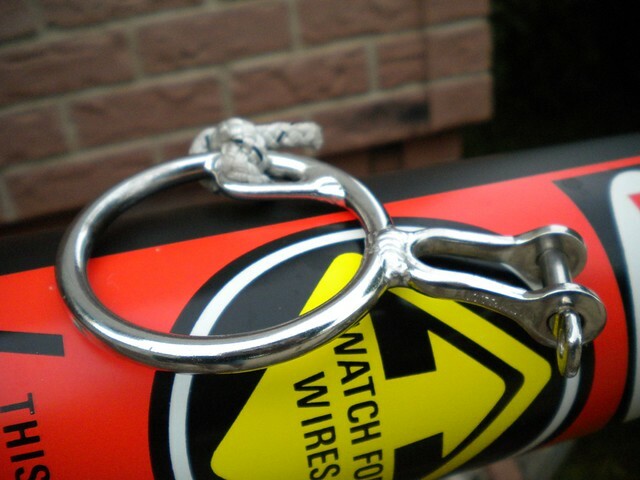 I picked up an Aussie halyard ring since they are considered by many to be a superior design. I have never really had a problem with the standard two-piece ring and clevis design, but thought I would give this a try. The knot is a funny over-hand style knot that I saw used before on halyard rings. 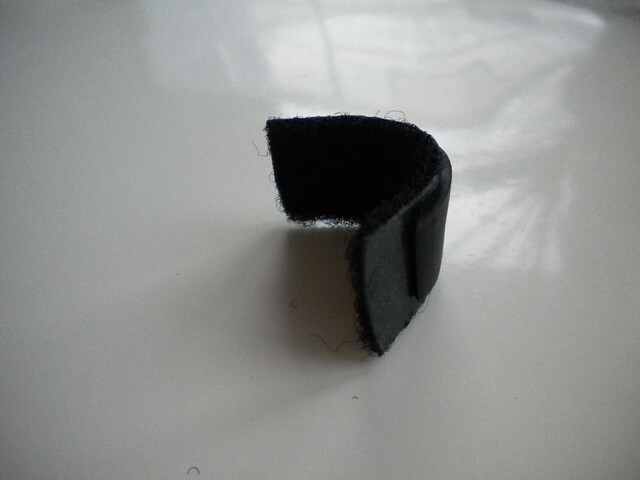 It works well because it is extremely low-profile.